All those numbers mean something. Royal Enfield Owners Club Chairman Graham Scarth wants the frame and engine numbers of Royal Enfield 350s in India — the motorcycles made before they were issued Vehicle Identification Numbers. 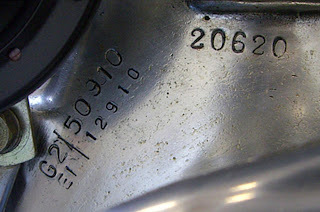 "Just received my first inquiry as result of posting my request for Indian Enfield numbers on your blog. One of your fellow countrymen (I believe) sent me five frame numbers, along with the requested photos of same, out of quite a few machines he had imported from India. "Three numbers had both G2 and EI stampings, and one of these frame numbers was from a batch of 100 that are 'blank' in the records from amongst those supplied to Enfield India. This has proved my suspicion that these machines were built and the omission is down to (very) poor record keeping at Redditch. "The other two were earlier and only had G2 numbers, the bikes being supplied to Hales Brothers in London. This has verified another of my suspicions that the large quantity of machines supplied to Hales in 1953-'54 were all destined for India. "The system works! Thanks, David." Anonymous I suggest you write to chairman@royalenfield.org.uk and provide those numbers to Graham Scarth. He can give you the answer, if he has it, for your machines. Good luck.